Product prices and availability are accurate as of 2019-04-16 05:55:42 EDT and are subject to change. Any price and availability information displayed on http://www.amazon.com/ at the time of purchase will apply to the purchase of this product. Each eight-tab pre-collated set includes seven of the most popular medical index titles used today, plus one writeable tab. Made of sturdy 90 lb. stock. Tabs are reinforced with tear proof colored Mylar. Tab titles include: Correspondence (orange), History & Physical (blue), Hospital (red), Insurance (brown), Lab/X-Ray (green), Miscellaneous (pink), Progress Notes (yellow) and white writable blank tab. 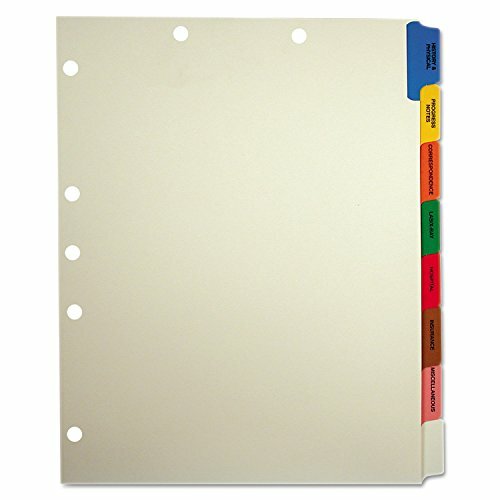 Eight tab pre-collated medical chart index set with seven preprinted titles and one blank tab. Eight-tab pre-collated set includes seven of the most popular medical index titles and one blank tab. Sturdy 90 lb. stock. 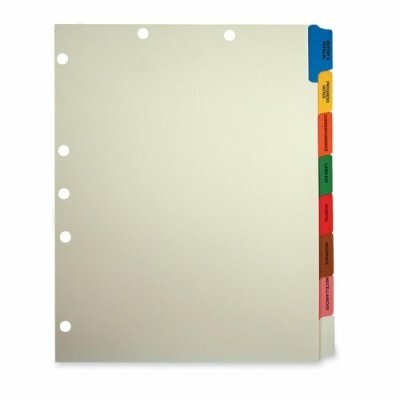 Tabs are reinforced with tear-proof colored Mylar. Tab titles include: Correspondence (orange), History & Physical (blue), Hospital (red), Insurance (brown), Lab/X-Ray (green), Miscellaneous (pink), Progress Notes (yellow) and white writable blank tab.